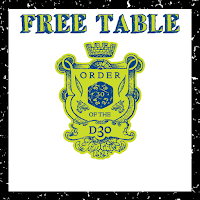 This Month's Free/PWYW d30 Table is up! By my own math I've made 45 d30 tables so far. Of course a huge part of this collection are the various combined height & weight tables, in both English and Metric, and some of the tables haven't been released yet. This month's table is the d30 Random Punishment Table. Do your players like to run amok and afoul with the law? 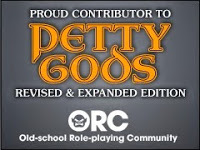 Do you have that one guy.....we all have that one guy....who plays Chaotic Stupid PCs? An appropriately modified roll on this chart might bring him back in line. This punishment table is a bit random, but has huge modifiers based on the severity of the crime committed. You start off with the most severe offense and add a simple +1 for each additional crime. Since some most of the punishments might put a bit of a crimp in your campaign there is a much simpler alternative punishment table that you could use if that helps you out as a GM. Like usual, click on either graphic to go to the download page, or use this link.